Time for another quick fleece test with the pattern I worked out last time. I did fix the lacking measurements before sewing of course. Which was taking up more time then I would have liked. But that’s all in the game ..
That’s a better balance in the seams being the front and center part equally wide at the bottom. The top seam seems to lift up the bust now instead of making it look hanging down like an old womans tired breast. So, let’s try to incorporate a nice power bar. I could have drawn one on paper like I usually do; tracing one part – sliding it against the second at the underwire line – tracing the second part – sliding it against the third at the underwire line – tracing the third part. But since the cup already had been sewn together I could just simply take it apart at the top edge, leaving the stitching at the underwire line intact. I want the power bar to be a decorative element at the outside of the cup. Preferably made out of scalloped lace or at least with the possibility to do so. And that means the bar should have a straight line because the scallops are always in a straight line. So I could just fiddle around with a ruler to find a good spot for the bar. It seemed a nice thought to let it end at the loose strap at the front. So I just draw a line there, cut it out of the black fleece and sew the whole thing back together in the fitting band. The bar was reduced to just looking kind of nice but not so powerfull anymore. And that was the whole idea; a bar with power and still looking nice. Kind of the Angelina Jolie of bras. To stay slim but also get that power back it might have to continue behind the loose front strap. To get a good view I cut off the front strap and pinned another piece black fleece all the way up to the top edge of the cup, folding and cutting untill it seemd right, probably enough support but not too heavy to look at. This procedure is called draping on the stand. In contrast to working it all out on paper first. The cup can be made with just the power bar or the loose strap can cover the power bar at midfront. We’ll find out after I finished this in real fabric. But first the power bar needed some more fine tuning. Because when I removed the cup and took it apart the bar was pretty messy shaped. To get a decent pattern I first traced the black fleece and then cleaned it up by tracing the pattern parts one by one. 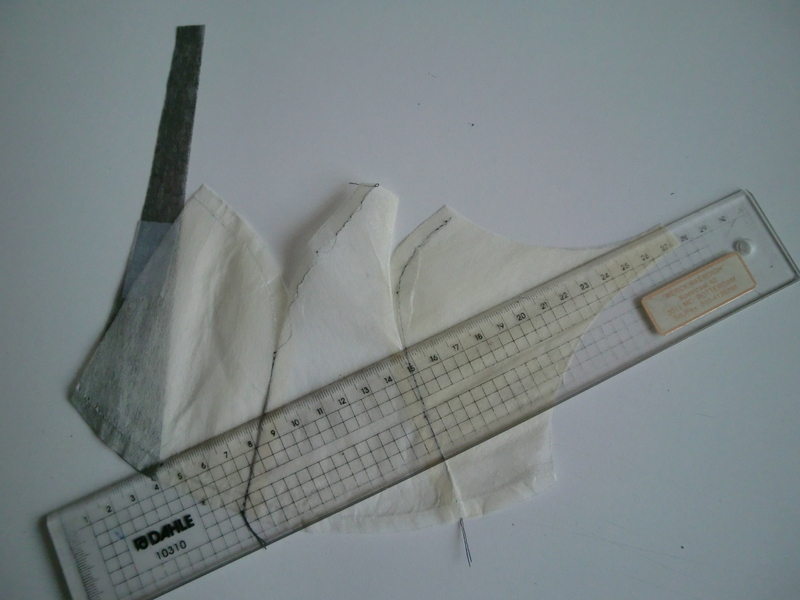 The lines across the piece are the seams of the pattern pieces. It would be impossible to shape the inside line as a straight line. It would be possible with just the scalloped lace since that will stretch but the bar also needs some non-stretch or low-stretch material to do it’s job. So I used the cup seams as seams for the power bar as well and that way it was not a problem to get the inner line in straight pieces. Looking forward to finally make a test in real fabric now! 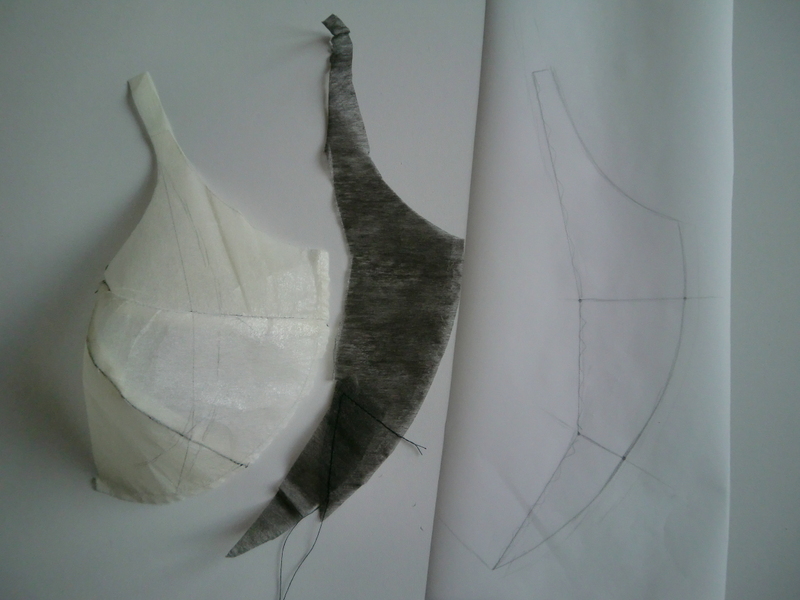 This entry was posted in E-F-G pattern development and tagged adjusting, bra, bra band, bra cup, bra pattern, comparing, design, developing, DIY, drawing, fabric cutting, fitting band, lace, lingerie, lycra, measuring, plunge bra, power bar, ruler, scallops, sewing, straps, support, trimming, underwear. Bookmark the permalink.